Turnkey Compliance Solutions is proud to support the community in which we – and our clients – work and live. To do this, we provide our team members with the opportunity to donate to their charity of choice, with our financial support. As an organization, we also support tomorrow’s science and engineering professionals through educational organization sponsorships and scholarships. Terrance Rowley presented Turnkey Compliance Solutions’ 2018 donation for the Naugatuck Food Bank to president, Marty-Lee Fenton and Joan Norton. Parishioners of the various churches in Naugatuck volunteer their time. All of the donations, food, and money to buy food, go directly to residents of Naugatuck who are in need. William Livesay, Joshua Feuerstein, and Arnav Paliwal eighth graders from Woodbridge, CT won the middle school Turnkey Compliance Solutions cash award for excellence in environmental services. Alex Araki, an eleventh grader from Greenwich, CT won the high school Turnkey Compliance Solutions cash award for his project, "Application of flexible PVDF nanofibrous membrane coated carbon fiber filter for tunable low cost solvent recycling." Mark Morgano, Turnkey Compliance Solutions founder, is pictured with Heather Gutshall, the founder of Handsome Dan’s Rescue for Pitbull-type Dogs. Also included is her daughter, Josephine, who is a fan-favorite of Handsome Dan’s nearly 600,000 followers on Facebook. Turnkey's co-founder, Michael Balda, participated in this Bosslift in April 2018 in support of Andrew Kavanah who had recently been deployed overseas. Begun in the early 1980s, the ESGR Bosslift program gives public and private employers an opportunity to see citizen airmen on the job when they are away from their civilian occupations. The Bosslift experience—which the ESGR bills as the “ride of a lifetime”—takes place throughout the U.S. and can range from mock convoy operations to video-simulated firefights, to flying to a briefing and Coast Guard installation. 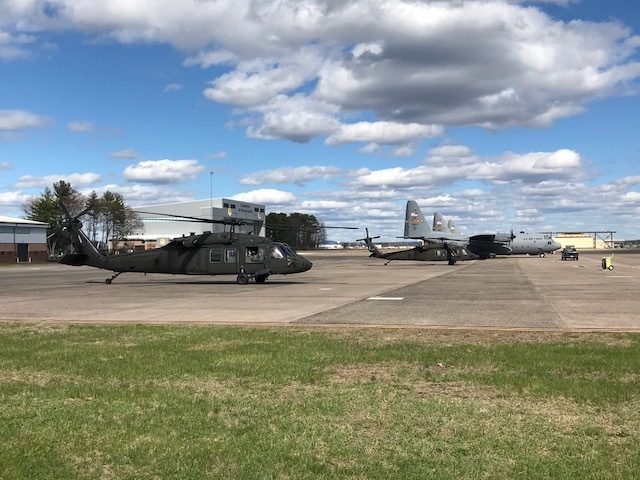 Is this Bosslift, Mike Balda participated in a tour of the Air Force's C-130 operations in Hartford and then flew to the Blackhawk maintenance/operation center in Groton. Then off to Camp Niantic to experience simulated weapons training, a showing of personnel and equipment as well as military police canine demonstrations. Flights between each location were courtesy of Army pilots, crew chiefs and two Blackhawk helicopters. The ESGR, a Department of Defense agency, offers the following tips for employers to support employees who serve in the National Guard or Reserves. Learn more about the role of the National Guard and Reserve by asking your employees what they do and how they fit into the big picture of national defense. Get to know your employees’ military commanders and supervisors; ask for advance notice of your employees’ annual military duty schedule to work out conflicts as soon as possible. Examine your personnel policies to see how they accommodate and support participation in the National Guard or Reserve. Encourage employee participation in the National Guard and Reserve and help them apply the training they receive from military duty. Discuss with your employees their service requirements before any problems arise and maintain open communication. Seek assistance from the ESGR. Ombudsmen serve as confidential, neutral liaisons for employers and employees seeking assistance or clarification regarding rights and responsibilities. Sign a Statement of Support for the National Guard and Reserve and display it prominently. Andrew Kavanah and his crew in Kuwait along with two of the planes he services (C-130s).